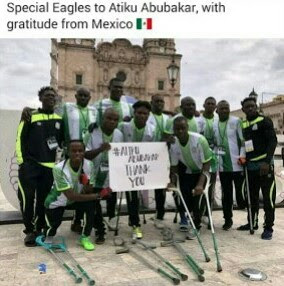 In appreciation of his financial support to the team which enabled them make history by representing Nigeria for the first time at the Amputee World Cup in Mexico, the Special ‘Amputee’ Eagles have expressed gratitude to the PDP presidential candidate, Atiku Abubakar, by posting a picture of the team on Facebook with a Thank you message from mexico. Hey Buddy!, I found this information for you: "Special ‘Amputee’ Eagles Thank Atiku For Financial Support". Here is the website link: https://headlinenews365.com/special-amputee-eagles-thank-atiku-for-financial-support/. Thank you.